We’ve all been there. You innocently walk into a restaurant, gym, repair shop, hospital, hotel lobby, etc., and you get that sick feeling when they have Fox “News” blaring on the TV. You know Fox isn’t news. You know it’s a propaganda campaign that’s poisoning the hearts and minds of millions of Americans with fear, misinformation, and hateful rhetoric. You want to speak up but suddenly you feel alone; like it’s you against the rest of the Fox-loving world. But no more! Now you can join the team of FoxBusters who speaking up and speaking out against toxic-to-democracy media outlets like Fox that have debased our politics, divided our families, and hijacked our public airwaves to push partisan propaganda. 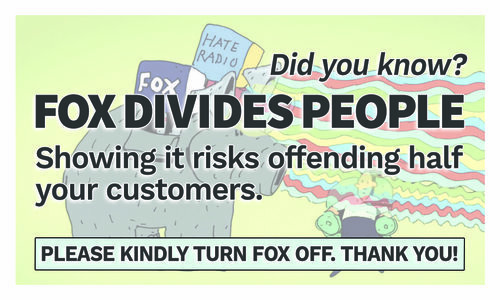 Become a card-carrying member of the #FoxOff movement now and together we can restore media sanity one TV at a time. Join team #FoxOff and do your part to get Fox "News" and hate radio OUT of restaurants, gyms, gas stations, hospitals, hotel lobbies, and anywhere else it's on in public. You may receive updates from HearYourselfThink.org, the sponsor of this fundraiser.